William Bryce and Raynor Christianson scored 0.78 masterpoints with a 52.59% game at Vashon Bridge Club. See full results of this game. Betty Lou Biggs and Lillian Thorsen scored 0.64 masterpoints with a 50% game at Vashon Bridge Club. See full results of this game. Blythe Bartlett and Cheryl Weise scored 0.45 masterpoints with a 52.5% game at Vashon Bridge Club. See full results of this game. Edna Dam and James Dam scored 2.48 masterpoints with a ★62.5%★ game at Vashon Bridge Club. See full results of this game. Gay Jungemann and Deb Wenneman scored 1.40 masterpoints with a 58.75% game at Vashon Bridge Club. See full results of this game. Beth de Groen and John Dunn scored 1.05 masterpoints with a 54.07% game at Vashon Bridge Club. See full results of this game. Janet Quimby and Marjorie Cornell scored 0.66 masterpoints with a 57.22% game at Vashon Bridge Club. See full results of this game. John McCoy and Mary Pekarek scored 0.88 masterpoints with a 59.52% game at Vashon Bridge Club. See full results of this game. Janna Gingras and Cheryl Weise scored 1.17 masterpoints with a ★60.48%★ game at Vashon Bridge Club. See full results of this game. Bob Hallowell and Roy Forsander scored 0.49 masterpoints with a 56.67% game at Vashon Bridge Club. See full results of this game. Betty Lou Biggs and Lillian Thorsen scored 0.31 masterpoints with a 51.43% game at Vashon Bridge Club. See full results of this game. John Dunn and Raynor Christianson scored 1.31 masterpoints with a ★61.11%★ game at Mercer Island Bridge Club. See full results of this game. Michael Martin and Steve Urban scored 0.92 masterpoints with a 52.92% game at Vashon Bridge Club. See full results of this game. Gay Jungemann and Deb Wenneman scored 1.40 masterpoints with a 53.33% game at Vashon Bridge Club. See full results of this game. Beth de Groen and John Dunn scored 0.92 masterpoints with a 52.92% game at Vashon Bridge Club. See full results of this game. Janna Gingras and Perry Cowgill scored 2.48 masterpoints with a ★63.33%★ game at Vashon Bridge Club. See full results of this game. Blythe Bartlett and Cheryl Weise scored 1.86 masterpoints with a ★62.08%★ game at Vashon Bridge Club. See full results of this game. John Dunn and Sudhakar Vaidya scored 0.24 masterpoints with a 48.51% game at Alki Bridge Club. See full results of this game. Kristen Elliott and Billie Hendrix scored 0.31 masterpoints with a 50.95% game at Vashon Bridge Club. See full results of this game. Deb Wenneman and Susie Kalhorn scored 0.65 masterpoints with a 57.14% game at Vashon Bridge Club. See full results of this game. John Dunn and Beth de Groen scored 1.09 masterpoints with a ★65.55%★ game at Vashon Bridge Club. See full results of this game. Mary Ann Nagler and Beverly Peterson scored 0.57 masterpoints with a 54.45% game at Vashon Bridge Club. See full results of this game. Doreen Higgins and Cathie Andersen scored 0.43 masterpoints with a 51.9% game at Vashon Bridge Club. See full results of this game. Janna Gingras and Cheryl Weise scored 0.87 masterpoints with a ★60%★ game at Vashon Bridge Club. See full results of this game. Beth de Groen and John Dunn scored 2.33 masterpoints with a ★63.02%★ game at Vashon Bridge Club. See full results of this game. Billie Hendrix and Beverly Peterson scored 0.98 masterpoints with a 51.05% game at Vashon Bridge Club. See full results of this game. Dave Schweinler and Steve Urban scored 1.31 masterpoints with a 56.77% game at Vashon Bridge Club. See full results of this game. Janna Gingras and Perry Cowgill scored 1.75 masterpoints with a ★61.98%★ game at Vashon Bridge Club. See full results of this game. John Dunn and Sudhakar Vaidya scored 0.78 masterpoints with a 46.62% game at Alki Bridge Club. See full results of this game. Steve Urban and William Bryce scored 0.54 masterpoints with a 54.17% game at Vashon Bridge Club. See full results of this game. Janet Quimby and Marjorie Cornell scored 0.82 masterpoints with a 55.56% game at Vashon Bridge Club. See full results of this game. Deb Wenneman and Susie Kalhorn scored 1.09 masterpoints with a ★61.81%★ game at Vashon Bridge Club. See full results of this game. Beth de Groen and John Dunn scored 0.54 masterpoints with a 54.17% game at Vashon Bridge Club. See full results of this game. Beverly Peterson and Mary Ann Nagler scored 0.51 masterpoints with a 49.31% game at Vashon Bridge Club. See full results of this game. 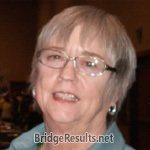 Doreen Higgins and Cathie Andersen scored 0.68 masterpoints with a 50% game at Vashon Bridge Club. See full results of this game. Midge Grace and Melvin Mackey scored 0.35 masterpoints with a 50.36% game at Vashon Bridge Club. See full results of this game. Beth de Groen and John Dunn scored 0.49 masterpoints with a 52.14% game at Vashon Bridge Club. See full results of this game. Barbara Garrison and Ellen Trout scored 0.22 masterpoints with a 42.09% game at Vashon Bridge Club. See full results of this game. Edna Dam and James Dam scored 0.70 masterpoints with a ★61.66%★ game at Vashon Bridge Club. See full results of this game. Moshe Rosenfeld and Steve Urban scored 0.70 masterpoints with a ★68.21%★ game at Vashon Bridge Club. See full results of this game. Janna Gingras and Perry Cowgill scored 0.49 masterpoints with a 59.16% game at Vashon Bridge Club. See full results of this game. Deb Wenneman and Susie Kalhorn scored 0.36 masterpoints with a 56.25% game at Vashon Bridge Club. See full results of this game. Steve Urban and William Bryce scored 0.72 masterpoints with a ★★75%★★ game at Vashon Bridge Club. See full results of this game. Beth de Groen and John Dunn scored 0.25 masterpoints with a 53.13% game at Vashon Bridge Club. See full results of this game. Doreen Higgins and Cathie Andersen scored 0.25 masterpoints with a 50% game at Vashon Bridge Club. See full results of this game. Roy Forsander and Bob Hallowell scored 0.50 masterpoints with a 57.29% game at Vashon Bridge Club. See full results of this game. Blythe Bartlett and Cheryl Weise scored 0.36 masterpoints with a 49.48% game at Vashon Bridge Club. See full results of this game. Neil Jungemann and Steve Urban scored 0.21 masterpoints with a 45.83% game at Vashon Bridge Club. See full results of this game. Midge Grace and Melvin Mackey scored 0.77 masterpoints with a ★60.94%★ game at Vashon Bridge Club. See full results of this game. Lynn Morgan and Moshe Rosenfeld scored 0.21 masterpoints with a 45.83% game at Vashon Bridge Club. See full results of this game. Beth de Groen and John Dunn scored 0.55 masterpoints with a 55.09% game at Vashon Bridge Club. See full results of this game. Kristen Elliott and Mary Pekarek scored 0.21 masterpoints with a 45.83% game at Vashon Bridge Club. See full results of this game. William Bryce and Raynor Christianson scored 0.39 masterpoints with a 51.05% game at Vashon Bridge Club. See full results of this game. Janna Gingras and Perry Cowgill scored 1.10 masterpoints with a ★66.67%★ game at Vashon Bridge Club. See full results of this game.